Cleopatra Thea (Greek: Κλεοπάτρα Θεά, which means "Cleopatra the Goddess"; c. 164 – 121 BC) surnamed Eueteria (i.e., "good-harvest/fruitful season") was the ruler of the Hellenistic Seleucid Empire. She was queen consort of Syria from 150 to about 125 BC as the wife of three Syrian kings: Alexander Balas, Demetrius II Nicator, and Antiochus VII Sidetes. She ruled Syria from 125 BC after the death of Demetrius II Nicator, eventually in co-regency with her son Antiochus VIII Grypus until 121 or 120 BC. Cleopatra Thea grew up in Egypt as the daughter of Ptolemy VI and Cleopatra II. She was probably born ca. 164 BC. She may have been engaged to her uncle Ptolemy VIII king of Cyrene in 154, but he eventually married her sister Cleopatra III. In 150 BC she married Alexander Balas in a sumptuous ceremony at Ptolemais Akko. The marriage produced a son named Antiochus VI Dionysus. In 145 BC her father invaded Syria, defeated Alexander Balas in battle and remarried her to Demetrius II, only to die a few days later. Demetrius set himself up as co-ruler with the young boy Antiochus VI, but may have killed him in 142 BC. In 139 BC Demetrius II was captured fighting against the Parthians and was held prisoner by them until 129 BC. After Demetrius was captured, his younger brother, Antiochus VII Sidetes, who was raised in the city of Side in Pamphylia, came to Syria and took the throne, marrying Cleopatra Thea in 138 BC. Cleopatra Thea bore him at least one son, Antiochus IX Cyzicenus. The names of any other children are uncertain. In 129 BC, the Parthians released Demetrius II, as a political manoeuvre against Sidetes, to claim his throne and his wife. That same year Sidetes was killed fighting the Parthians. Cleopatra had taken the precaution of sending Antiochus IX (her son by Antiochus VII) to Cyzicus in Asia Minor (hence his surname). Demetrius returned home and regained his throne, taking Cleopatra Thea as his wife by his side. In 132/131 BC Cleopatra Thea's mother, Cleopatra II of Egypt rebelled against her brother Ptolemy VIII Euergetes II Tryphon. In 127 BC Cleopatra II fled to her son-in-law Demetrius' court in Syria. Demetrius' elder son, Seleucus, became king with the name Seleucus V in 125 BC; however, his mother, Cleopatra Thea, had him murdered soon after. From 125 BC to 121 BC, Cleopatra ruled Syria and to legitimize her reign, she shared the throne with her son, Antiochus VIII Grypus. Antiochus VIII was married to Tryphaena, the daughter of Ptolemy VIII and Cleopatra III. Grypus became less controllable as he grew up and in 121 BC Cleopatra Thea decided to eliminate him. As he returned from a hunt one day, she offered him a cup of wine. Since this was not common behavior for her, Grypus was suspicious and forced her to drink the wine, which killed her. Grypus re-organised the state and for the next eight years he provided stability and financial recovery. This period would end ca. 114 BC, when Cleopatra Thea's other son, Antiochus IX Cyzicenus, returned to Syria to claim the throne and civil war started again. Cleopatra Thea was a daughter of Ptolemy VI and Cleopatra II of Egypt. She had two brothers named Ptolemy Eupator and Ptolemy respectively. Her sister Cleopatra III was Queen of Egypt and married to Ptolemy VIII, an uncle, who had been a former co-ruler of Cleopatra Thea’s parents. It is possible that Berenice, the fiancée of Attalus III, king of Pergamum is another sister. She married Alexander Balas (Greek: Ἀλέξανδρος Βάλας) in about 150 BC. This union produced Antiochus VI Dionysus. Alexander Balas was neither popular, nor an efficient ruler. The marriage was dissolved by her father. Alexander Balas died in battle against Demetrius II of Syria in 145 BC. 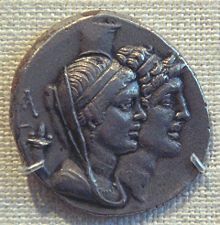 Cleopatra Thea married Demetrius II Nicator (Greek: Δημήτριος Νικάτωρ) in 145 BC. Demetrius became a captive of the Parthians from 139-129 BC. He was assassinated in Tyre in 125 BC at the orders of his wife Cleopatra Thea. Demetrius and Cleopatra Thea had at least two sons–Seleucus V Philometor, who was killed by his mother for taking the crown without her permission; and Antiochus VIII Grypus, who eventually killed his mother in turn. They also had a daughter Laodice, whom Phraates II of Parthia captured and later married for her beauty. Cleopatra Thea married Demetrius' younger brother Antiochus VII Sidetes in 137 BC after Demetrius was captured by the Parthians. Cleopatra and Antiochus VII had at least one son: Antiochus IX Cyzicenus. They also likely had two other sons named Antiochus and Seleucus and one or two daughters named Laodice. ^ Ogden, Daniel (1999). Polygamy Prostitutes and Death. The Hellenistic Dynasties. London: Gerald Duckworth & Co. Ltd. p. 150. ISBN 07156 29301. Wikimedia Commons has media related to Cleopatra Thea.